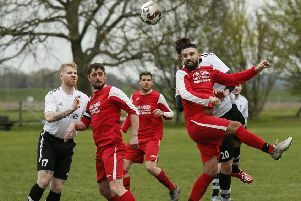 Kempston Rovers’ defender Robbie Goodman went from villain to hero as he rescued a late point in his side’s 2-2 Southern League Division One Central draw at home to Northwood on Saturday. The centre half, who had been caught out for Northwood’s second goal, made amends in style, hammering home from close range in stoppage time. Kempston had led after 30 minutes when Danny Watson was superbly put through by Ben Shepherd to find the net for his 24th goal of the season. The goal seemed to liven up the visitors as a swift counter attack was turned in by the Northwood forward Myles Stephenson on the stroke of half time. The second half began brightly for Rovers, Watson and Munashe Sundire going close. However, they were behind the hour mark when Stephenson caught out an indecisive Goodman at the back post to slot the ball past Carl Knox. Kempston responded positively and Watson almost made it 2-2, denied by keeper Borja Loeches-Teixeira. As time ticked away, Rovers stopper Knox went up for a corner and when Northwood couldn’t clear their lines, Goodman was there to slam the ball into the roof of the net. Rovers were knocked out of the Beds Senior Cup at the semi-final stage on Tuesday night, losing 3-0 at home to AFC Dunstable as BJ Christie scored twice and Courtney Massay netted from 40 yards to seal the victory. The Walnut Boys visit Aylesbury United on Saturday, with the visitors still missing goalkeeper Martin Conway with a hand injury, while Alex Stoyles is out for up to two months due to a knee problem.